Bernie Sanders’ visit to L.A. happened to coincide with the vernal equinox, but he wasn’t in town to court the city’s crystals and reiki crowd. 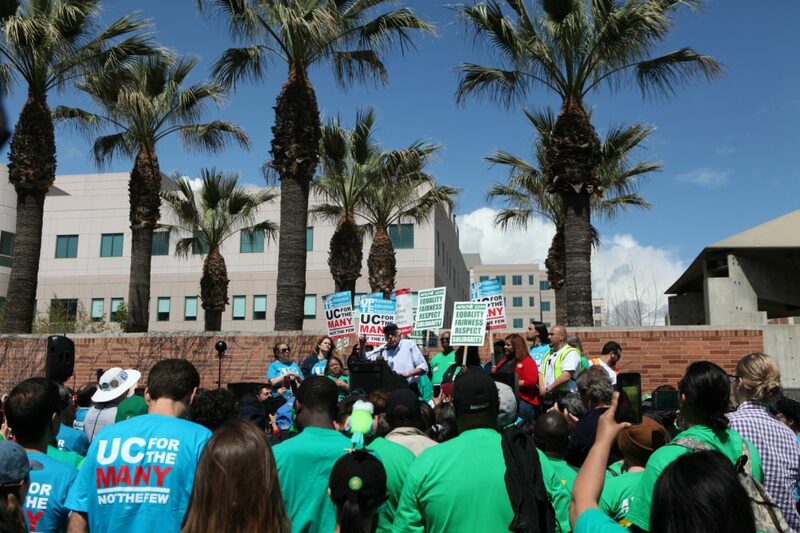 The Virgo from Vermont stopped by UCLA to speak at a rally for striking UC employees, presenting himself not as a candidate for president, but as an ally to workers. While Sanders received a blaring reception by the crowd, others felt that his real audience lay on the other side of the news cameras and notebooks. “I am here today, I should tell you, not as a candidate for president, but as somebody who has spent the last 40 years of his life walking on picket lines with unionized workers,” he said. Long before he rose to national prominence, Sanders legislated and advocated for robust unions and broad workers’ rights. But even as Sanders made efforts to compartmentalize his roles as candidate and activist, the rally itself seemed to undermine him. On either side of him, picket signs and posters spelled out one of the slogans of the rally: “UC For the Many, Not the Few,” a line that Sanders himself employed when announcing his recent bid for the presidency. “Our campaign is about creating a government and economy that works for the many, not just the few,” he wrote in an email to supporters. 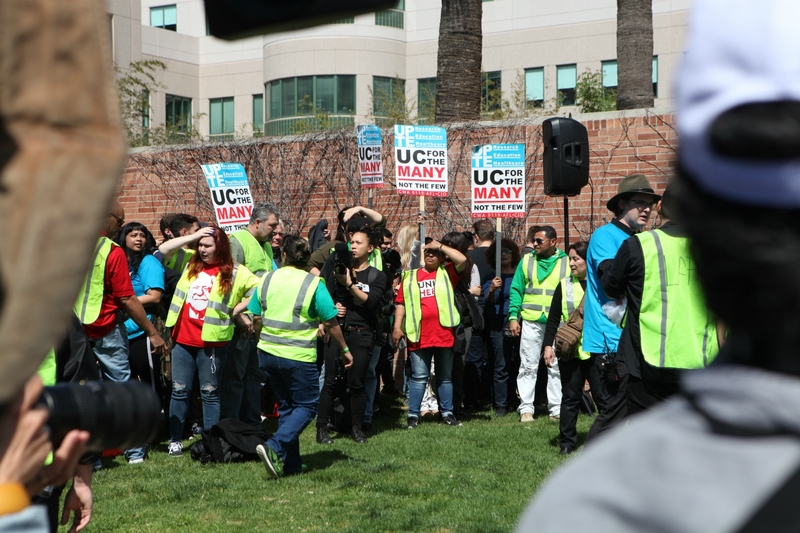 Sanders’ appearance on stage was preceded by speakers from unions representing UC employees, who walked out of negotiations with the University of California last week. The Democratic Party has become markedly more liberal since Sanders’ last run in 2016, so the senator may have to work harder to distinguish himself from the rest of the field. While he differentiated himself from Hillary Clinton in 2016 by supporting positions like Medicare for All, other candidates like Senator Elizabeth Warren, Congressman Cory Booker, and Senator Kamala Harris have proposed similar plans of their own. The rally provided a perfect vehicle for Sanders’ message of economic populism, railing against the excesses of the one percent and increasing income inequality. But even here, Sanders began to stray into campaign territory, hinting at solutions in the way of a political candidate. “If I have anything to say about it—and I expect that I will—we are going to make it easier for workers to join unions, not harder,” he told the crowd. The optics of Sanders’ solidarity may play well nationally, but for some who attended in person, it felt like the Senator hijacked the event.